At least thirteen people were killed and 28 injured when a fire broke out at an apartment complex in Ho Chi Minh City’s district 8 in early morning today. 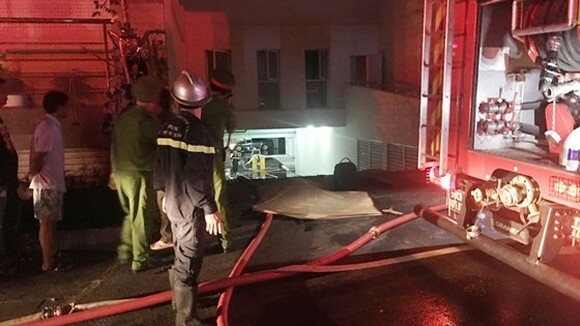 The fire along with an explosion in the Carina Plaza high-rise building's basement floor at 1648 Vo Van Kiet Street started at the midnight and soon spread to the upper floors. Though residents in the condo were sleeping, they managed to escape the building when discovering smoke from the basement. Those stuck in the building tried to run to higher floors waving towel, clothes and flashlight to shout for help. Some of them had to jumped from the high floor. Just few minutes later, more than 200 fire fighters arrived in the spot in 34 truck fires. At 5.30 AM, firemen at last put out the fatal fire. Deputy director of firefighting station senior lieutenant-colonel Nguyen Thanh Huong said 13 people died in the fire and 28 other got injured. Carina Plaza was put in use in 2009 on Vo Van Kiet Street with three blocks of 15 to 21 stories tall. It is home to more than 736 families. 115 emergency center mobilized 4 ambulance vehicles, said a driver in addition to vehicles from hospitals Trieu An, Nguyen Tri Phuong, hospital in district 6, and Children Hospital No.1. More than 10 vehicles continuously transferred suffocated patients to hospitals. Deputy Head of the Department of Health Dr. Tang Chi Thuong directed medical workers to urgently provide treatment to patients. People’s Committee in district 8 announced to give VND15 million to families of dead people and VND6 million for families of injured people.